I have decided to start a series of blogs in which I review my favourite 'Pinup Picks' of the last month. 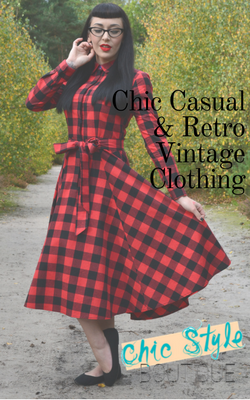 More often than not nowadays, I have to resort to window shopping online, so I may as well share what pinup pretties I am lusting after with you! So, towards the end of each month, please join me in pouring over stuff we can't afford!! This outfit, which has been deemed acceptable to wear outdoors, contains the word 'pyjamas'. I mean, this is the dream, right? 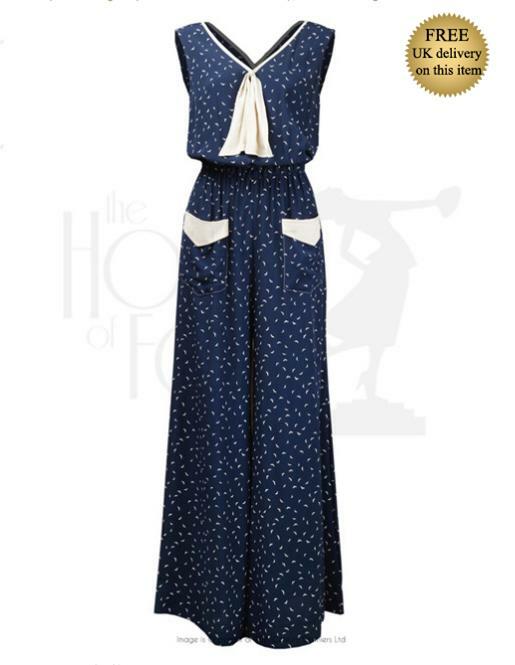 I spotted these 1930's style beach Pj's from The House of Foxy on Twitter and I instantly fell in love. One thing I find with pinup fashion is that my outfit is usually 95% style and 5% comfort, so the thought of these super lightweight, casual and relaxed pj's was just too much to handle. The pj's are loose fitting with a stretch waist, so there is no limit on the amount of tea and cake you can consume in these bad boys! I have wanted to purchase something from the wonderful Violets in May for so long, yet deciding on what to go for is hard work; everything is so beautiful. The Brittany Playsuit however has been on my mind for ages. I think it is the versatility of it. It comprises a playsuit and a detachable skirt. 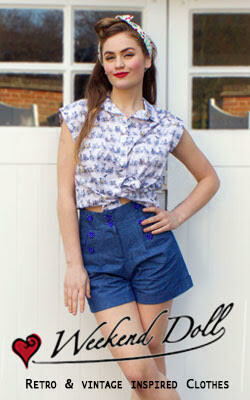 Everything on the Violets in May website is handmade by super seamstress Lola Diamond pictured above. The Brittany Playsuit Set retails at £120+ and is available from Violets in May. Whilst pouring over the fabulous range of jeans Freddies of Pinewood have, I noticed this Shirt-Jacket, which I thought would be a perfect solution to the unpredictable British weather. It is lightweight and can be worn all year round. Come to mention it, this whole outfit is perfect (*pops it all in imaginary basket). 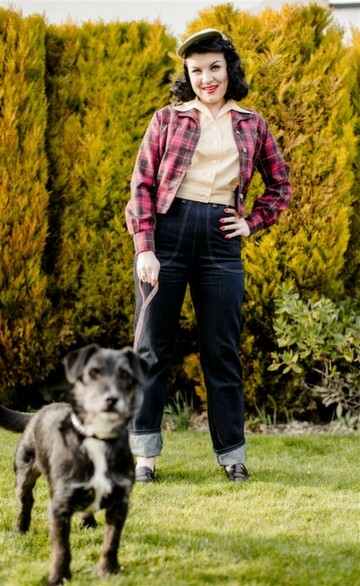 The shirt-jac compliments Freddies huge range of jeans and shirts for the perfect rockabilly ensemble. The Cherry Tartan Shirt-Jac retails at £65 and is available from Freddies of Pinewood. I saw these new Princess Pom Puff pumps from Pinup Girl Clothing on Instagram and they are possibly the cutest things I have ever seen! I have about as much elegance as a drunk elephant, so these heels would last 5 minutes under my stompy feet, but they are so simple and cute and pretty and I want them in every colour (they come in Pink, Yellow and Mint)!! The Princess Pom Puff Pumps retail at $38 (£28.95) and are available from Pinup Girl Clothing. Micheline Pitt's new 'Vixen' clothing line is to die for. I am obsessed with black and red, and this whole collection is practically based around that colour pallet. The 'Beat it Creep' top is so simple yet so stylish at the same time; something which can be said for the whole collection. This top is now back in stock and I NEED it! The 'Beat it Creep' top retails at £25.02 and is available from Etsy. So there you have it! Those are my July Pinup Picks. If you have purchased any of the above and would like to let me know your thoughts on them, please do leave a comment below.